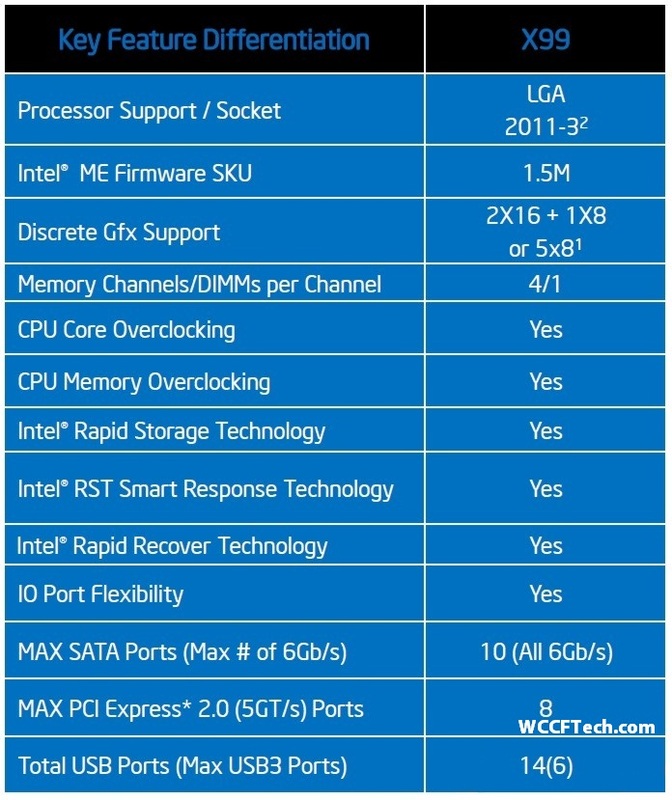 Intel Haswell-E and the X99 Chipset “Wellsburg” (the same chipset that will support DDR4 I might add) are probably one of the most anticipated arrivals of this year. I have some new details regarding the X99 Chipset along with some old ones that we have already given before. Without further ado, lets begin. 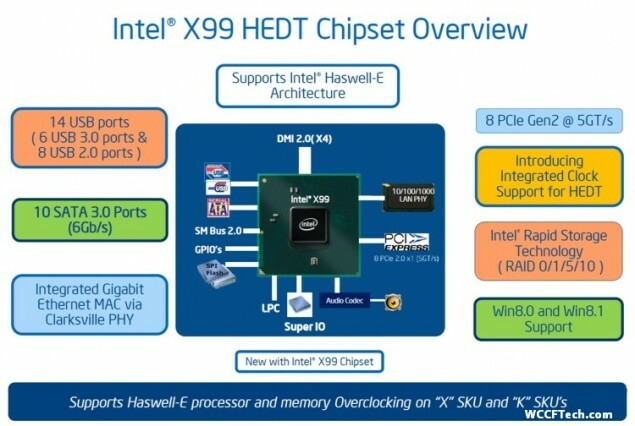 This leak is pretty straight forward and only contains some solid hard facts about the X99 Chipset, we already knew it was coming in Q3 and the month is June. Without any further ado, here is the feature sheet for the X99 Chipset codenamed “Wellsburg”. So apart from the fact that X99 will support DDR4, something that nearly everyone seems to know, here are all the features that X99 will, well, feature. If it ain’t here, it most probably isn’t included. Basically X99 will support the LGA 2011-3 Socket. It will support overclocking for both the ‘X’ and ‘K’ variants and has 4 Memory Channels. It will support CPU (Ratios and BCLK) and GPU overclocking and will have all the usual features such as Intel Rapid Storage and RST Smart Response Tech (and Rapid Recover too). It will have 14 USB ports and 10 Sata ports. Interestingly it will also feature Intel’s Integrated Clock Support. Even more interestingly perhaps is the fact that both 6 core and 8 core variants will utilize 140 W TDP. It will feature a maximum memory speed of 2133Mhz per DIMM slot. This is an important bit as it tells us the max frequency for the DDR4 Ram supported with X99. It goes without saying that PCI-E 3.0 will be supported. X99 will ship with support for AVX 2.0 and will also have the Fully Integrated Voltage Regulator. Hyper-threading will also of course be supported along with Turbo Boost 2.0 and finally Intel’s Smart Cache Tech, which will range upto 20MB LLC.